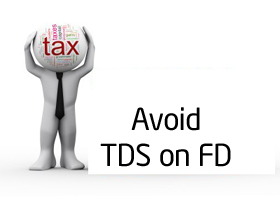 Home » Incometax » How to Avoid TDS on FD? Fixed deposited is most preferred investment option by Indians, fixed deposit offers fixed return with safety. Fixed deposit although give benefit of fixed return and safety but also brings problem of TDS. You must be aware that it is mandatory by bank to deduct TDS @ 10%, if interest earned from FD exceed above Rs 10,000. This TDS deduction will significantly reduce your maturity amount. So question arise is how to avoid TDS on FD? Do we have any scope? Yes investor can avoid TDS on FD by following ways. Very simple way to avoid TDS on FD is by submitting form 15G/15H.If investor total income is below exemption limit, he can submit form 15G and bank will not deduct any TDS on interest earned on FD. If investor is senior citizen than he can submit form 15 H to avoid TDS. You can download form 15 G and 15 H from here. This form you need to submit to bank at the beginning of every financial year. This form should contain information about your FD. You can avoid TDS on FD by timing FD. For timing FD you need to take care that interest earn on FD is not exceeding Rs 10,000 in financial year. Suppose you want to invest Rs 1.2 lac in FD giving 10% interest. If you start this FD with1 year on 1st April, 2014 than interest earned on FD will be Rs 12,000 as amount is exceeding limit of Rs 10,000 TDS will be applicable. But if you start this FD on 1st July, 2014 than 9 month interest amount will be calculated as income and you can avoid TDS. If you split FD across multiple banks and branches you can avoid TDS. You need to split FD in such a manner that the interest earned on FD does not exceed the Rs 10,000 limits. For this you need to take care that you are keeping this FD in multiple banks and branches. However by choosing this option you are just avoiding TDS but you still need to include this income in to your income tax return and pay tax according to your income. Suppose you want to invest Rs 1.2 lac in FD giving 10% interest. If you place this FD in single bank for 1 year starting from 1st April, 2014, than the interest earned per annum will be Rs 12,000 and TDS will be deducted. However if you split your investment across two banks with FD of Rs 60,000 each then interest earned on each FD will be Rs 6000 only and no TDS will be deducted. What do you do to avoid TDS on FD share your views…..
« Whatsapp Message of Pizza – How money goes out of India?